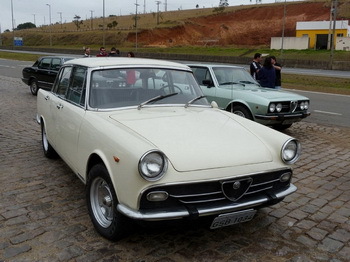 Last weekend hundreds of Brazilian admirers of the Italian cuore sportivo gathered in Caxambu, Minas Gerais, the Alfa Romeo enthusiasts coming from all parts of the country, from cities such as Recife/PE and Porto Alegre/RS. Last weekend hundreds of Brazilian admirers of the Italian cuore sportivo gathered in Caxambu, Minas Gerais, the Alfa Romeo enthusiasts coming from all parts of the country, from cities such as Recife/PE and Porto Alegre/RS. Besides the amazing exhibition of historic-to-modern cars, Encontro Alfa Romeo 2011, the fourth such national gathering dedicated to Alfa Romeo fans in Brazil, boasted illustrious names, a fascinating lecture and a unique auction. "Encontro Alfa Romeo 2011 was simply spectacular! It was worth every minute of dedication that we applied to make it happen and demonstrate the value that Brazilian Alfisti give to the Alfa Romeo brand and its cars," said Tulio Silva, President of the Alfa Romeo Clube of Minas Gerais. 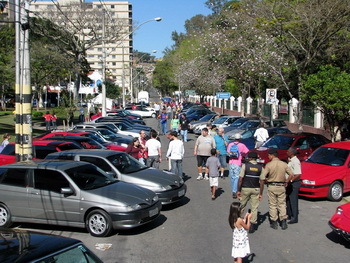 The event was organized by the Alfa Romeo Clube Minas Gerais, with massive participation from the Alfa Romeo BR Group members (from which the Alfa Romeo Clube MG originated and is still part of), and the city of Caxambu was chosen as it is equally distant from São Paulo (SP), Rio de Janeiro (RJ) and Belo Horizonte (MG), the three main cities in Brazil. The official opening ceremony took place in front of the traditional Hotel Gloria and was highlighted by the unveiling of the Alfa Romeo MiTo. Not available in Brazil, the MiTo is straight from the new generation of Alfa Romeo models, with a thoroughly modern design and a compact size. Proudly lined up around the MiTo were a dazzling array exhibits that showcased a mix of domestic-built and imported-from-Italy Alfa Romeos, with the oldest on display, the Fábrica Nacional de Motores (FNM) 2000 JK from 1962, winning awards. The FNM 2000 JK, named after the Brazilian President of the day, Juscelino Kubitschek, was built in Rio de Janeiro between 1960 and 1968, and it opened up an Alfa Romeo footprint in Brazil that was to last for a quarter of a century. The 2000 JK was replaced by the 2150, and this similarly significant historic model was also much in evidence. Finally, in 1974, and now under the full control of Alfa Romeo itself, FNM launched the Alfa Romeo 2300, an exclusively Brazilian-built sedan which was produced through to 1986; and, in a historical automotive footnote, it was exported to Europe in 1978 for the German market, dubbed the Alfa Romeo Rio. 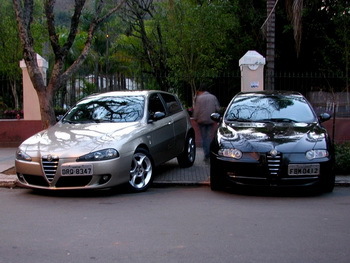 Novelties at Encontro Alfa Romeo 2011 included a string of facelifted versions of the Alfa 156 and Alfa 166. The restyled versions of these stylish D- and E-segment sedans were never actually sold in Brazil, rather they are the result of an independent modification process made in São Paulo by specialist, AlfasWorld, and as such only the front end is changed with the new clip. Other modern-era Alfa Romeo models on show included the 145, 155, Spider (916) and 147. "There were seventy five cars of a single brand. A great opportunity to socialise with old and new models," said Guilherme Jardim, Event Director of the Alfa Romeo Club of Minas Gerais, who was responsible for organising the meeting. One event highlight was the 'Alfa Road Trip'. 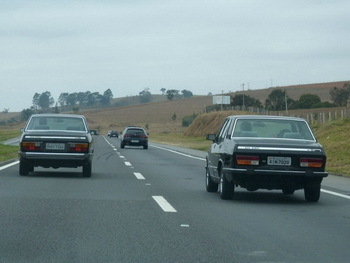 Groups of fans started in Florianopolis, Rio de Janeiro, Belo Horizonte and Sao Paulo, driving their cars in convoys to the rendezvous in Caxambu. 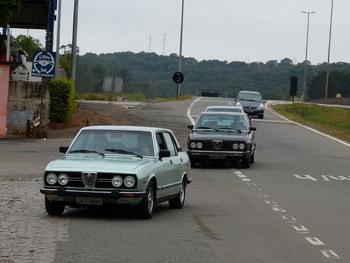 One of the groups of enthusiasts had nine examples of the Alfa 2300, the statuesque Alfa Romeo model that was produced only in Brazil, in convoy, a stunning sight that brought the rich history of Alfa Romeo in Brazil straight back to life. Personalities were in evidence and no more so than, all the way from Switzerland, Dr. Axel Marx, a leading worldwide Alfa Romeo expert. He said of the meeting: "A few things struck me. First, the brand passion of the Brazilians. It's amazing. Second, the kindness of the organisers and participants. The place is very beautiful, and well chosen." Dr. Axel was actually a consultant in the design of the Alfa 8C Competizione, a car that reclaimed the status of classic Italian design. The lecture was presented by Alfista Robson Cotta, and titled 51 years of Alfa Romeo in Brazil. Meanwhile, the special auction featured several pieces entered by Roberto Nasser, the curator of the National Automobile Museum in Brasilia, who was also present. This exciting initiative between the Museum and the Alfa Romeo Clube Minas Gerais is in favour of the restoration of an important historic pre-war Alfa Romeo grand prix single seater which is part of the collection of the long-closed down and abandoned Museo Roberto Lee in Caçapava. The collection of cars are finally being restored, after falling into severe disrepair over the last two decades, following an agreement having been hammered out with Lee's heirs who have now relinquished control of the remaining 27 cars in the collection. Meanwhile the Alfa Romeo Clube Minas Gerais is already planning the 2012 edition of the Brazilian Alfa Romeo 'day', which will be the fifth such national gathering, again to be held in Caxambu, and promising to be even bigger and brighter than this year.